Dry ice sublimates at 194.65 K (−78.5 °C; −109.3 °F), at Earth atmospheric pressures. This extreme cold makes the solid dangerous to handle without protection due to burns caused by freezing (frostbite). While generally not very toxic, the outgassing from it can cause hypercapnia (abnormally elevated carbon dioxide levels in the blood) due to buildup in confined locations. For supplementary chemical data, see Carbon dioxide data. Dry ice is the solid form of carbon dioxide (CO2), a molecule consisting of a single carbon atom bonded to two oxygen atoms. Dry ice is colorless, non-flammable, with a sour zesty odor, and can lower the pH of a solution when dissolved in water, forming carbonic acid (H2CO3). At pressures below 5.13 atm and temperatures below −56.4 °C (−69.5 °F) (the triple point), CO2 changes from a solid to a gas with no intervening liquid form, through a process called sublimation. [note 1] The opposite process is called deposition, where CO2 changes from the gas to solid phase (dry ice). At atmospheric pressure, sublimation/deposition occurs at −78.5 °C (−109.3 °F) or 194.65 K.
The density of dry ice varies, but usually ranges between about 1.4 and 1.6 g/cm3 (87 and 100 lb/cu ft). The low temperature and direct sublimation to a gas makes dry ice an effective coolant, since it is colder than water ice and leaves no residue as it changes state. Its enthalpy of sublimation is 571 kJ/kg (25.2 kJ/mol). It is generally accepted that dry ice was first observed in 1835 by French inventor Adrien-Jean-Pierre Thilorier (1790–1844), who published the first account of the substance. In his experiments, it was noted that when opening the lid of a large cylinder containing liquid carbon dioxide, most of the liquid carbon dioxide quickly evaporated. This left only solid dry ice in the container. In 1924, Thomas B. Slate applied for a US patent to sell dry ice commercially. Subsequently, he became the first to make dry ice successful as an industry. In 1925, this solid form of CO2 was trademarked by the DryIce Corporation of America as "Dry ice", thus leading to its common name. That same year the DryIce Co. sold the substance commercially for the first time; marketing it for refrigerating purposes. Dry ice is easily manufactured. First, gases with a high concentration of carbon dioxide are produced. Such gases can be a byproduct of another process, such as producing ammonia from nitrogen and natural gas, oil refinery activities or large-scale fermentation. Second, the carbon dioxide-rich gas is pressurized and refrigerated until it liquefies. Next, the pressure is reduced. When this occurs some liquid carbon dioxide vaporizes, causing a rapid lowering of temperature of the remaining liquid. As a result, the extreme cold causes the liquid to solidify into a snow-like consistency. Finally, the snow-like solid carbon dioxide is compressed into small pellets or larger blocks of dry ice. Dry ice is typically produced in three standard forms: large blocks, cylindrical small (1⁄2 or 5⁄8 in [13 or 16 mm] diameter) pellets and cylindrical tiny (1⁄8 inch [3.2 mm] diameter), high surface to volume pellets that float on oil or water and do not stick to skin because of their high radii of curvature. Tiny dry ice pellets are used primarily for ice blasting, quick freezing, fire fighting, oil solidifying and have been found to be safe for experimentation by middle school students wearing appropriate personal protective equipment such as gloves and safety glasses. A standard block weighing approximately 30 kg (66 lb) covered in a taped paper wrapping is most common. These are commonly used in shipping, because they sublime relatively slowly due to a low ratio of surface area to volume. Pellets are around 1 cm (0.4 in) in diameter and can be bagged easily. This form is suited to small scale use, for example at grocery stores and laboratories where it is stored in a thickly insulated chest. Dry ice can be used to flash-freeze food or laboratory biological samples, carbonate beverages, make ice cream, solidify oil spills and stop ice sculptures and ice walls from melting. Dry ice can be used to arrest and prevent insect activity in closed containers of grains and grain products, as it displaces oxygen, but does not alter the taste or quality of foods. For the same reason, it can prevent or retard food oils and fats from becoming rancid. When dry ice is placed in water, sublimation is accelerated, and low-sinking, dense clouds of smoke-like fog are created. This is used in fog machines, at theaters, haunted house attractions, and nightclubs for dramatic effects. Unlike most artificial fog machines, in which fog rises like smoke, fog from dry ice hovers near the ground. Dry ice is useful in theater productions that require dense fog effects. The fog originates from the bulk water into which the dry ice is placed, and not from atmospheric water vapor (as is commonly assumed). It is occasionally used to freeze and remove warts. However, liquid nitrogen performs better in this role, since it is colder so requires less time to act, and less pressure. Dry ice has fewer problems with storage, since it can be generated from compressed carbon dioxide gas as needed. Plumbers use equipment that forces pressurised liquid CO2 into a jacket around a pipe. The dry ice formed causes the water to freeze, forming an ice plug, allowing them to perform repairs without turning off the water mains. This technique can be used on pipes up to 4 inches (100 mm) in diameter. Dry ice can be used as bait to trap mosquitoes, bedbugs, and other insects, due to their attraction to carbon dioxide. It can be used to exterminate rodents. This is done by dropping pellets into rodent tunnels in the ground and then sealing off the entrance, thus suffocating the animals as the dry ice sublimates. Tiny dry ice pellets can be used to fight fire by both cooling fuel and suffocating the fire by excluding oxygen. The extreme temperature of dry ice can cause viscoelastic materials to change to glass phase. Thus, it is useful for removing many types of pressure sensitive adhesives. Dry ice can be used for loosening asphalt floor tiles or car sound deadening material making it easy to prise off, as well as freezing water in valveless pipes to enable repair. One of the largest mechanical uses of dry ice is blast cleaning. Dry ice pellets are shot from a nozzle with compressed air, combining the power of the speed of the pellets with the action of the sublimation. This can remove residues from industrial equipment. Examples of materials removed include ink, glue, oil, paint, mold and rubber. Dry ice blasting can replace sandblasting, steam blasting, water blasting or solvent blasting. 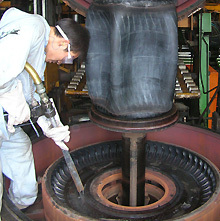 The primary environmental residue of dry ice blasting is the sublimed CO2, thus making it a useful technique where residues from other blasting techniques are undesirable. Recently, blast cleaning has been introduced as a method of removing smoke damage from structures after fires. Dry ice is also useful for the de-gassing of flammable vapours from storage tanks — the sublimation of dry ice pellets inside an emptied and vented tank causes an outrush of CO2 that carries with it the flammable vapours. The removal and fitting of cylinder liners in large engines requires the use of dry ice to chill and thus shrink the liner so that it freely slides into the engine block. When the liner then warms up, it expands, and the resulting interference fit holds it tightly in place. Similar procedures may be used in fabricating mechanical assemblies with a high resultant strength, replacing the need for pins, keys or welds. Dry-ice blasting, a form of carbon dioxide cleaning, is used in a number of industrial applications. In laboratories, a slurry of dry ice in an organic solvent is a useful freezing mixture for cold chemical reactions and for condensing solvents in rotary evaporators. Dry ice and acetone forms a cold bath of −78 °C (−108 °F; 195 K), which can be used for instance to prevent thermal runaway in a Swern oxidation. The process of altering cloud precipitation can be done with the use of dry ice. It was widely used in experiments in the US in the 1950s and early 1960s before it was replaced by silver iodide. Dry ice has the advantage of being relatively cheap and completely non-toxic. Its main drawback is the need to be delivered directly into the supercooled region of clouds being seeded. A "dry ice bomb" is a balloon-like device using dry ice in a sealed container such as a plastic bottle. Water is usually added to accelerate the sublimation of the dry ice. As the dry ice sublimes, pressure increases, causing the bottle to burst causing a loud noise that can be avoided when a #3 rubber stopper replaces the screw-on cap to make a water rocket with a two-liter bottle. The dry ice bomb device was featured on MythBusters, episode 57 Mentos and Soda, which first aired on August 9, 2006. It was also featured in an episode of Time Warp, as well as in an episode of Archer. Following the Mars flyby of the Mariner 4 spacecraft in 1966, scientists concluded that Mars' polar caps consist entirely of dry ice. However, findings made in 2003 by researchers at the California Institute of Technology have shown that Mars' polar caps are almost completely made of water ice, and that dry ice only forms a thin surface layer that thickens and thins seasonally. A phenomenon named dry ice storms was proposed to occur over the polar regions of Mars. They are comparable to Earth's thunderstorms, with crystalline CO2 taking the place of water in the clouds. Dry ice is also proposed as a mechanism for Geysers on Mars. In 2012, the European Space Agency's Venus Express probe detected a cold layer in the atmosphere of Venus where temperatures are close to the triple point of carbon dioxide and it is possible that flakes of dry ice precipitate. Observations from the Uranus flyby by Voyager 2 indicates that dry ice is present on the surface of its large moons Ariel, Umbriel and Titania. Scientist speculate that the magnetic field of Uranus contributes to the generation of CO2 ice on the surfaces of its moons. Voyager 2 observations of Neptune's moon Triton suggested the presence of dry ice on the surface, though follow up observations indicate that the carbon ices on the surface are carbon monoxide but that the moon's crust is composed of a significant quantity of dry ice. Dry ice pellet subliming in water, releasing thick white fog. Prolonged exposure to dry ice can cause severe skin damage through frostbite, and the fog produced may also hinder attempts to withdraw from contact in a safe manner. Because it sublimes into large quantities of carbon dioxide gas, which could pose a danger of hypercapnia, dry ice should only be exposed to open air in a well-ventilated environment. For this reason, dry ice is assigned the S-phrase S9 in the context of laboratory safety. Industrial dry ice may contain contaminants that make it unsafe for direct contact with foodstuffs. Tiny dry ice pellets used in dry ice blast cleaning do not contain oily residues. Although dry ice is not classified as a dangerous substance by the European Union, or as a hazardous material by the United States Department of Transportation for ground transportation, when shipped by air or water, it is regulated as a dangerous good and IATA packing instruction 954 (IATA PI 954) requires that it be labeled specially, including a diamond-shaped black-and white label, UN 1845. Also, arrangements must be in place to ensure adequate ventilation so that pressure build-up does not rupture the packaging. The Federal Aviation Administration in the US allows airline passengers to carry up to 2.5 kg (5.5 lb) per person either as checked baggage or carry-on baggage, when used to refrigerate perishables. ^ Above the triple point, CO2 goes through the more familiar transitions via a liquid phase. ^ Thilorier (1835). "Solidification de l'Acide carbonique". Comptes Rendus (in French). 1: 194–196. See also: "Solidification of carbonic acid," The London and Edinburgh Philosophical Magazine, 8 : 446–447 (1836). In a patent (no. 2896) which was filed on May 16, 1831 and which was published in 1836, Adrien-Jean-Pierre Thilorier, an employee of the French "Administration des postes" (i.e., Post Office) in Paris is identified explicitly as the inventor of a machine for compressing gases which in 1829 won the French Academy of Sciences' Montyon prize for mechanics. The patent describes the machine and its performance in detail. See: (French Ministry of Commerce), "Pour le perfectionnement d'une machine à comprimer le gaz, …" (For the improvement of a machine to compress gas, …), Description des Machines et Procédés consignés dans les brevets d'invention, 30 : 251–267 (1836). ^ a b Killeffer, D.H. (October 1930). "The Growing Industry-Dry-Ice". Industrial & Engineering Chemistry. 22 (10): 1087. doi:10.1021/ie50250a022. ^ The Trade-mark Reporter. United States Trademark Association. 1930. ISBN 978-1-59888-091-5. ^ "What is Dry Ice?". Continental Carbonic Products, Inc. Archived from the original on 2009-07-27. Retrieved 2009-07-26. ^ a b "Carbon Dioxide (CO2) Properties, Uses, Applications: CO2 Gas and Liquid Carbon Dioxide". Universal Industrial Gases, Inc. Retrieved 2009-07-26. ^ a b "How does dry ice work?". HowStuffWorks. April 2000. Retrieved 2009-07-26. ^ "Dry Ice Sales – How to sell Dry Ice". dryiceinfo.com. Retrieved 6 July 2015. ^ a b "Cool Uses for Dry Ice". Airgas.com. Archived from the original on 2010-12-01. Retrieved 2009-07-25. ^ "Preparing Competent E. coli with RF1/RF2 solutions". Personal.psu.edu. Retrieved 2009-07-25. ^ Blumenthal, Heston (2006-10-29). "How to make the best treacle tart and ice cream in the world". London: The Sunday Times. Retrieved 2007-06-12. ^ Kuntzleman, Thomas S.; Ford, Nathan; No, Jin-Hwan; Ott, Mark E. (2015-04-14). "A Molecular Explanation of How the Fog Is Produced when Dry Ice Is Placed in Water". Journal of Chemical Education. 92 (4): 643–648. Bibcode:2015JChEd..92..643K. doi:10.1021/ed400754n. ISSN 0021-9584. ^ Lyell A. (1966). "Management of warts". British Medical Journal. 2 (5529): 1576–9. doi:10.1136/bmj.2.5529.1576. PMC 1944935. PMID 5926267. ^ Reisen WK, Boyce K, Cummings RC, Delgado O, Gutierrez A, Meyer RP, Scott TW (1999). "Comparative effectiveness of three adult mosquito sampling methods in habitats representative of four different biomes of California". J Am Mosq Control Assoc. 15 (1): 24–31. PMID 10342265. ^ "City Deploys Dry Ice To Exterminate Rats". New York Daily News. ^ a b Horrell, Bill (February 1961). "Dry ice pops off Asphalt Tile". Popular Mechanics. 115 (2): 169. ^ Mundis, Warren J. (July 1960). "Dry Ice as a Plumbing Aid". Popular Science. 177 (1): 159. ^ Wolcott, John (January 2008). "Ice-blasting firm offers a cool way to clean up". The Daily Herald. Archived from the original on January 9, 2008. Retrieved 2008-01-20. ^ "All About Ice – Ice Carvings, Vodka Luges, Crushed and Dry Ice". allaboutice.com. Retrieved 6 July 2015. ^ "Bushing and Plain Bearings Press or Shrink Fit Design and Application – Engineers Edge". engineersedge.com. Retrieved 6 July 2015. ^ "Mythbusters episode 57". mythbustersresults.com. ^ a b Mars Poles Covered by Water Ice, Research Shows. National Geographic. 13 February 2003. Retrieved 2009-07-26. ^ Byrne, S.; Ingersoll, AP (2003-02-14). "A Sublimation Model for Martian South Polar Ice Features". Science. 299 (5609): 1051–3. Bibcode:2003Sci...299.1051B. doi:10.1126/science.1080148. PMID 12586939. ^ Dry Ice Storms May Pelt Martian Poles, Experts Say. National Geographic. 19 December 2005. Retrieved 2009-07-26. ^ J. J. Jian; W. H. Ip, eds. (2006). "Lunar and Planetary Science XXXVII (2006) - Observation of the Martian Cryptic Region from Mars Orbiter Camera" (PDF). Retrieved 4 September 2009. ^ A curious cold layer in the atmosphere of Venus. European Space Agency (1 October 2012). ^ Cartwright, R.J.; Emery, J.P.; Rivkin, A.S.; Trilling, D.E. ; Pinilla-Alonso, N. (2015). "Distribution of CO2 ice on the large moons of Uranus and evidence for compositional stratification of their near-surfaces". Icarus. 257: 428–456. arXiv:1506.04673. Bibcode:2015Icar..257..428C. doi:10.1016/j.icarus.2015.05.020. ISSN 0019-1035. ^ Lellouch, E.; de Bergh, C.; Sicardy, B.; Ferron, S.; Käufl, H.-U. (2010). "Detection of CO in Triton's atmosphere and the nature of surface-atmosphere interactions". Astronomy and Astrophysics. 512: L8. arXiv:1003.2866. Bibcode:2010A&A...512L...8L. doi:10.1051/0004-6361/201014339. ISSN 0004-6361. ^ Nelson, Lewis (2000). "Carbon Dioxide Poisoning". Emergency Medicine. Retrieved 2009-07-28. ^ "Regulation (EC) No 1272/2008 of the European Parliament". Retrieved 2009-07-31. ^ Requirements for Shipping Dry Ice (IATA PI 954). Environmental Resource Center. 24 May 2006. Retrieved 2009-07-31. ^ "Hazardous Materials Information for Passengers". faa.gov. Retrieved 2009-07-26. Duane, H. D. Roller; Thilorier, M. (1952). "Thilyorier and the First Solidification of a "Permanent" Gas (1835)". Isis. 43 (2): 109–113. doi:10.1086/349402. JSTOR 227174. Häring, Heinz-Wolfgang (2008). Industrial Gases Processing. Christine Ahner. Wiley-VCH. ISBN 978-3-527-31685-4. Retrieved 2009-07-31. Housecroft, Catherine; Sharpe, Alan G (2001). Inorganic chemistry. Harlow: Prentice Hall. p. 410. ISBN 978-0-582-31080-3. Retrieved 2009-07-31. Verma, N. K.; Khanna, S. K.; Kapila, B. (2008). Comprehensive Chemistry for Class XI. New Delhi: Laxmi Publications. ISBN 978-81-7008-596-6. Retrieved 2009-07-31. McCarthy, Robert E. (1992). Secrets of Hollywood Special Effects. Boston: Focal Press. ISBN 978-0-240-80108-7. Mitra, Somenath (April 2004). Sample Preparation Techniques in Analytical Chemistry. Wiley-IEEE. ISBN 978-0-471-32845-2. Retrieved 2009-07-31. Treloar, Roy D. (2003). Plumbing Encyclopaedia (3rd ed.). Wiley-Blackwell. p. 175. ISBN 978-1-4051-0613-9. Retrieved 2009-07-31. Yaws, Carl (2001). Matheson Gas Data Book (7th ed.). McGraw-Hill Professional. ISBN 978-0-07-135854-5. 982 pages. Retrieved 2009-07-27. Wikimedia Commons has media related to Dry ice.